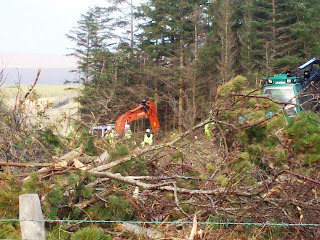 Sale Of Forestry Harvesting Rights Abandoned ... or are they? This afternoon there was jubilation around the country among the 1000s of people who have been re-entering the wonderful joy of walking in Ireland's forests lately. I'll provide a link to the whole thing at the end of this. Be careful, I see this re-structuring as a potential back door to obtaining a stronger legal stance to sell off harvesting rights, invite international supersize wind farm companies to come in and replace the forests, and let the Fracking companies come in and have a go too. and renew a ancient forest culture for the present. We need to keep walking, using and enjoying our forests regularly. Simon Coveney, Agriculture Minister in Ireland, said the Government will now focus on creating a new company - merging Coillte and Bord na Mona to develop thr country's commercial bio-energy and forestry interests. Simon Coveney also said the decision to stall the sale of harvesting of the trees was based on concerns for loss of at least 12,000 jobs, public access and eventual financial losses too such as making 400-774 million euro from a quick sale leading to 1.3 billion euro loss over time. However, he also said a future sale has not been ruled out with the Government reconsidering all options again in 18 months' time, once the restructuring and merger with Bord na Mona with Coillte is completed. As a reminder, Coillte was one of several companies that are owned or part owned by the Ireland State, along with Aer Lingus and Bord Gais Energy and the ESB, that was being considered for sell off to fulfill terms of the EU-IMF Troika bailout to fund the losses of speculative debts created by banks and investment managers. I can only echo what I say in blog posts and other posts time and time again. 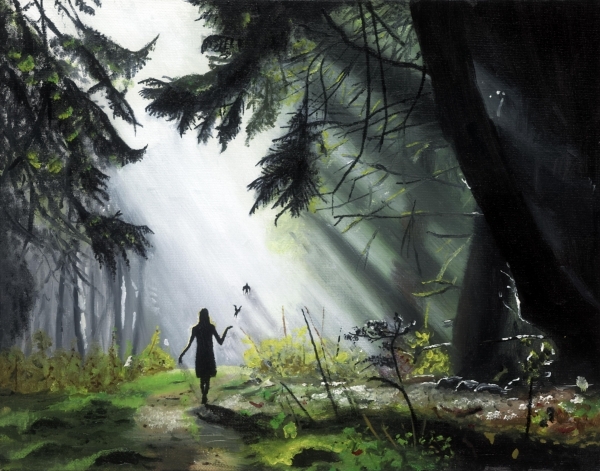 We need more people be in our woods more often to discover what they enjoy and feel is precious in the forests. This builds up forest passion and eventually forest culture. Hopefully, within 18 months there will also be a general election which is a time when TDs listen to us the most as this is when people have power over their careers. I had a Japanese man visit a few days ago and he explained how vast amount of Japanese forests are now gone or cannot be entered into due to the nuclear fall out from the power plants after the earthquakes. So we have 18 months to build up our forest passion in Erin. before any government considerations and politics are even made. I totally agree John...we need to be on our guard. Would'nt trust this lot, the wording of the announcement was very non committal to the long term preservation of our forests. This government is the most deceitful we have ever had. They lied their way into power and they are using expensive spin-doctors to feed us a diet of lies and untruths. They absolutely can not be trusted and we must be vigilant and stay on our guard because the merger of Coillte and Bord na Móna is a suspicious move and we don't know exactly what they are scheming. We should have regular "Walk in the woods" events and encourage many more people to utilize the fantastic treasure that our woods and forests are. To me, the most important approach to the forests now is encouraging people to use them for their own benefits and well being. If people build up a passion for the forests through using them a forest culture and instinct would develop. This, I hope, would lead to more local community co-operative initiatives and activities around the forest linked to leisure, well being, materials for construction, fuel, food and education. As this becomes solid among the people it will be translated through votes, which is what we have to stop the plunder. A commitment to the forests rather than commitment to protest is what is needed now.